This elegant recipe by The Cookery School at Little Portland Street would make a gorgeous dinner party starter and it only takes 20 minutes to make. Use the freshest ingredients you can find for best results. For the dressing, in a small bowl, whisk together all the ingredients until thickened, then set aside. Clean the scallops by slicing off any muscle fibres (discard) and the orange and white roes, if you want. Pat the scallops dry with kitchen paper, then lightly drizzle with the sesame oil. Heat a ridged griddle pan (or frying pan) until smoking hot, add the scallops and cook for 2-3 minutes until starting to turn golden brown on one side. Turn (in the same order as you added them to the pan) and cook for another 2-3 minutes. They should be lightly golden on top and still feel quite springy when touched. Don’t overcrowd the pan or the scallops will steam. Transfer to a plate and season with salt and pepper. Toss the salad leaves in a small bowl with a little of the oriental dressing, then divide between 2 plates. 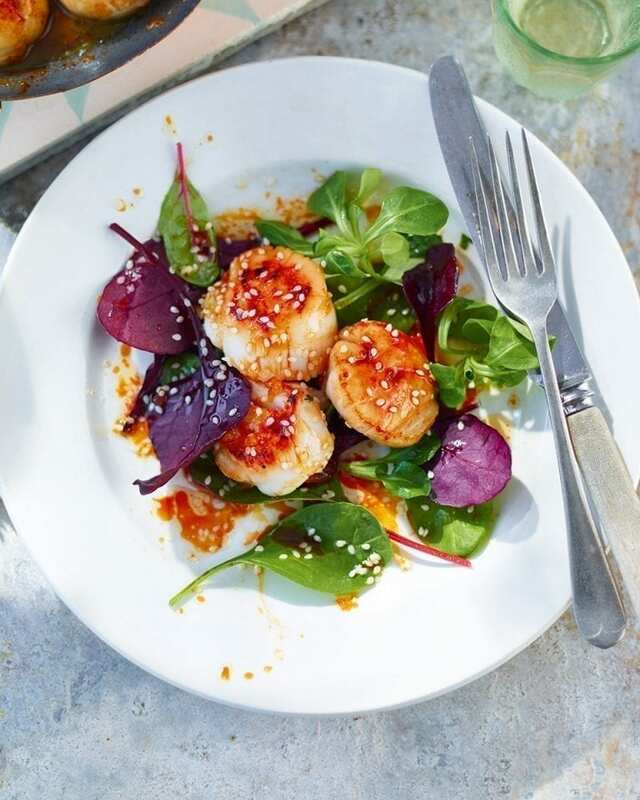 Arrange the scallops on top, drizzle with more dressing and sprinkle with the sesame seeds. Recipe by The Cookery School at Little Portland Street. If you can’t find apple concentrate you can get it online from healthysupplies.co.uk. Otherwise heat 100ml fresh apple juice in a pan over a medium heat and reduce until syrupy. You could remove the flavourful scallop roes for neatness, but we prefer to leave them on.